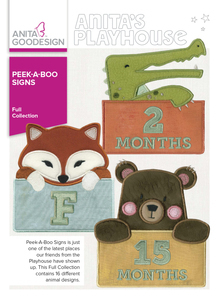 Peek-A-Boo Signs is just one of the latest places our friends from the Playhouse have shown up. 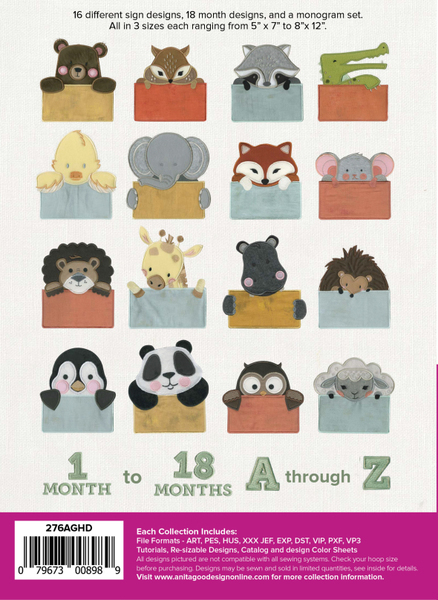 This Full Collection contains 16 different animal designs, all holding blank signs that can be customized in any number of ways. Included in the collection is a complete monogram set as well as designs for an infant or toddlers monthly age. All designs in this collection come in three different sizes. Merge the month designs with your favorite cuddly critters, and stitch the designs directly onto onesies for a fun, creative way to photographically chart each month in baby’s growth. Put baby’s name on the sign and hang it on the nursery door. Stitch to a tote for a personalized travel or diaper bag. Bibs, burp cloths, blankets, and more. We’re sure you won’t run out of ideas with Peek-A-Boo Signs.